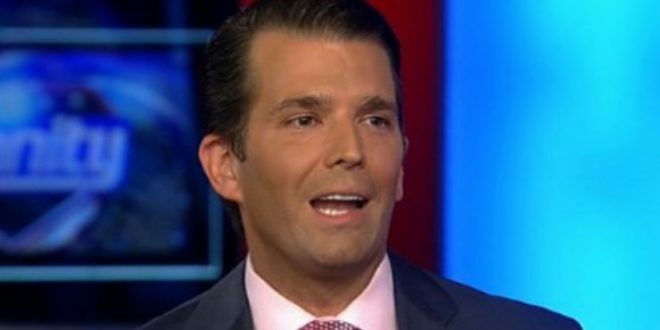 Junior Rages At Vanity Fair Over Impeachment Story - Joe.My.God. Donald Trump Jr. accused Vanity Fair on Friday of purchasing some of the site’s more than 4 million Twitter followers after the magazine reported that Trump Jr. was worried his father, President Trump, has trouble sleeping. In a tweet, the president’s eldest son attacked the news magazine as “sad” and “irrelevant,” while urging Vanity Fair reporters to “keep making crap up” about him and his father’s administration. Trump Jr. offered no evidence for the alleged purchase of fake followers other than low interaction rates on the Twitter account’s posts. Last month Junior posted a terribly photoshopped image which falsely claimed Glorious Leader’s approval rating is 50%. He did not take down the tweet despite widespread ridicule.